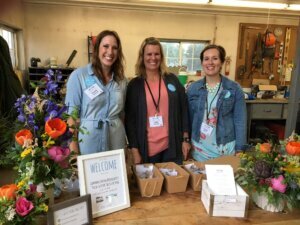 Last week, CommonGround Minnesota held it’s annual “Field To Fork” Blogger Bash, inviting Twin Cities bloggers and foodies to Wolf Creek Dairy near Dundas for an evening of conversation about food and farming. 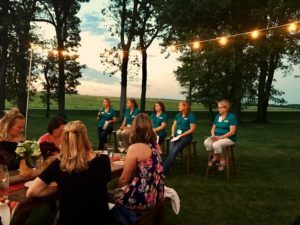 Les and Jeanne Anderson and their three adult daughters, Danielle, Kelsey (and fiancé Jake) and Kirsten, welcomed fifty moms from the Twin Cities out to their corn and soybean farm in Welch last week. 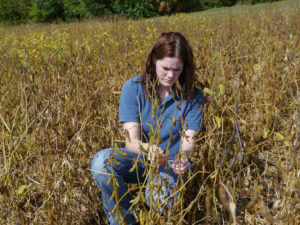 The metro area women spent the late afternoon learning about modern agriculture. A dining table seating fifty at the crest of a hilly meadow was the perfect setting to discuss food on a mid-August evening in Mazeppa. 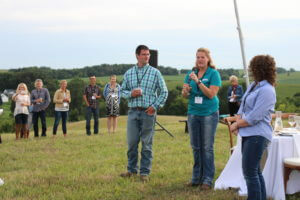 The event was a “Field-To-Fork” dinner, hosted by CommonGround Minnesota and farmers Katie and Ted Brenny, who raise beef cattle. Both Katie and Ted are fifth generation farmers. With great precision, advanced plant breeding techniques with acronyms like CRISPR, CRISPR-Cas, and TALEN, will more reliably produce the food consumers are looking for and, at the same time, help farmers conserve natural resources, reduce impacts on the environment, and plant crops with a greater assurance that what they plant will grow to maturity and be gathered at harvest time. A small group of CommonGround volunteers from across the U.S.
She came to the farm Tuesday night with a lot of appreciation for what farmers do, but also with some burning questions. Barb Schank, the school nutrition director for Waconia Independent School District, feeds 4,000 kids every school day, and she wants to know what’s in the pork products her students eat. When we, agriculturalists, want to get our message out to the public, one of the first things we do is boot up our computer to our social media channels. After our fingers fly on the keyboard writing out the message we want to say, with the simple click of a button our message is on the World Wide Web. Might as well hit the “Staples Button” because that was easy. Organic farming gets a lot of attention, both good and bad. As someone who comes from a traditional farming background with genetically modified crops and pesticides, I am usually quick on the defensive when it comes to a discussion around organics. My eyes were opened by Carolyn Olson and Emily Zweber at the CommonGround volunteer training on June 24, at the Minnesota Corn office in Shakopee. Why: Because we all enjoy a farm-themed good time as part of Kernel Nation. Minnesota’s corn farmers are bringing a piece of the farm to Edgewater Park in Albert Lea as part of its inaugural Kernel Nation event on June 30. You know what an ‘elevator’ is—it’s a grain storage facility. An ‘operation’? It’s a farming entity comprising all the pieces of land, buildings and equipment you and your family and partners use to raise crops and livestock. But for people who don’t farm or have an ag background, a large percentage of the population, those words can have an entirely different meaning. An elevator carries people up and down to different floors of a building.